Boil the pasta as directed, leaving it on the al-dente side, to avoid sticking. Once done, rinse with cold water, again, to prevent it sticking to itself. Slice the eggplant into 1/2 inch thick slices. Macerate the eggplant by sprinkling with salt and let sit for about 10 minutes. 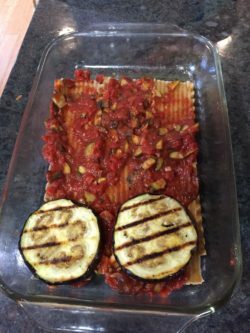 This will cause water to come out of the eggplant. Blot dry with a paper towel, then flip over and repeat with the other side. Heat up your grill (or if you don’t have one, you could try the broiler in the oven). 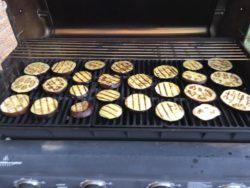 Brush each eggplant slice with olive oil, grill over medium-high heat 3-5 minutes, then brush the top side and flip, again for about 3-5 minutes. You know when the eggplant is done when it cuts like butter. Set aside for later. In a large saucepan on medium-high heat, sauté the onions and garlic for 5-10 minutes, until translucent and soft. Add the zucchini and sauté another 5 minutes. 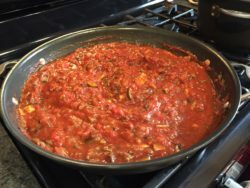 Add the diced tomatoes, spices, tomato paste, vegetarian ground beef and wine (if using). 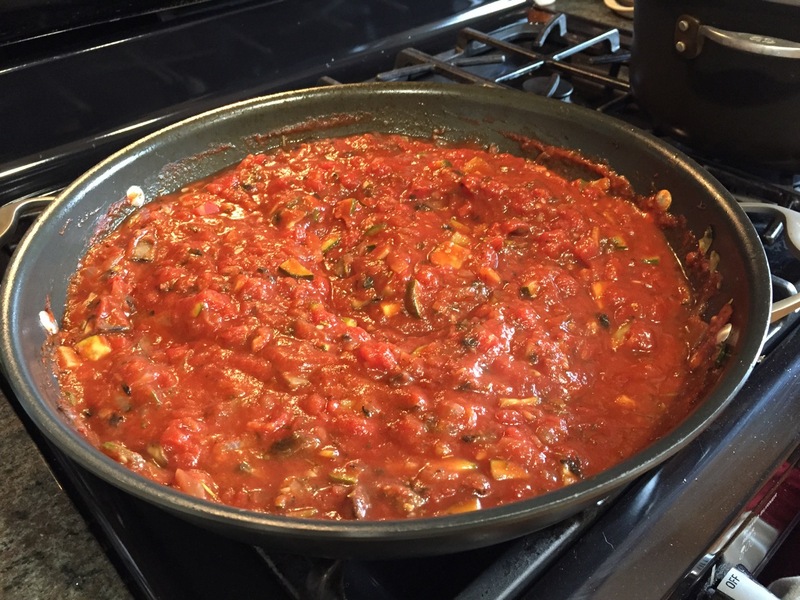 Reduce heat to medium-low and simmer for about 20 minutes. Set aside. Making sure the spinach is fully thawed, squeeze out excess water. 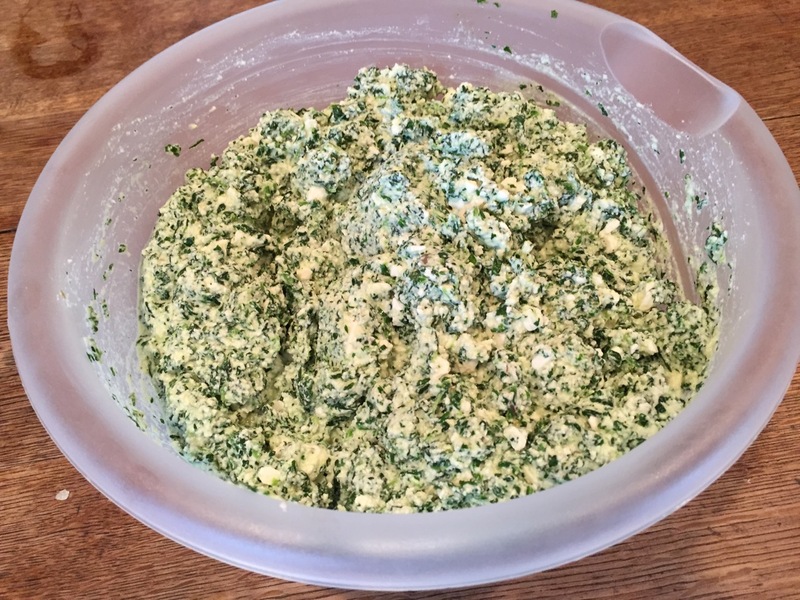 Mix together all of the ricotta, half of the mozzarella, half of the parmesan, spinach and nutmeg. 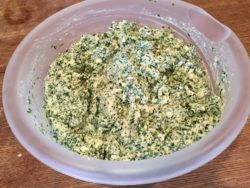 Whisk the 2 eggs, then combine with the spinach and cheese. Set aside. 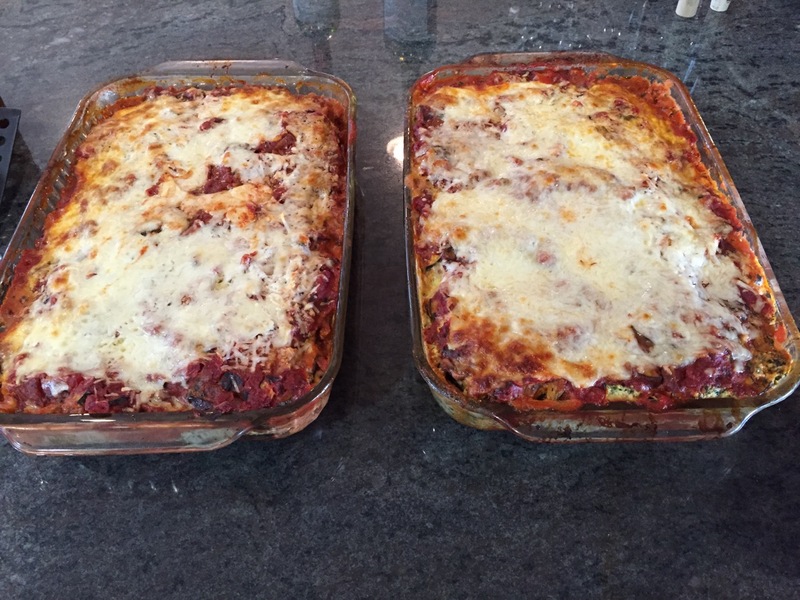 Lightly coat 2 13×9 inch baking dishes with olive oil. 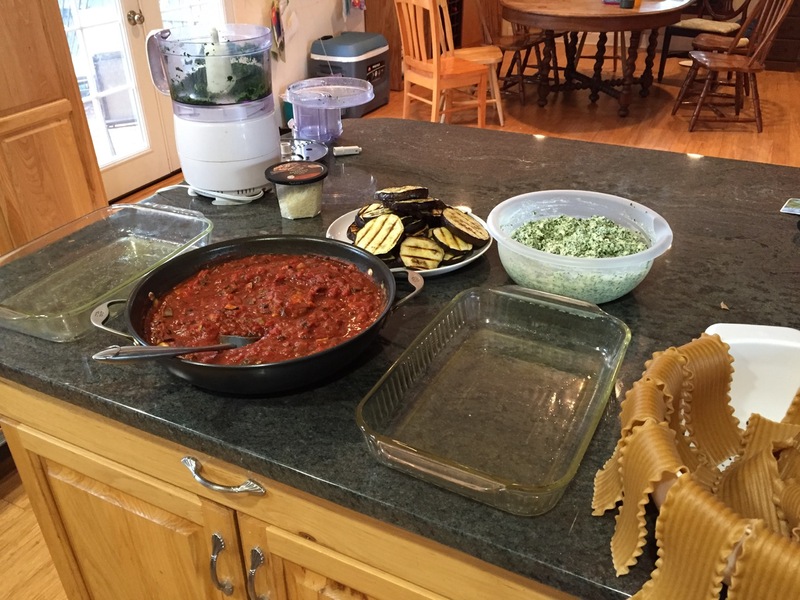 Lay out 3 lasagna noodles in each dish, then top with 1/3 of the sauce. 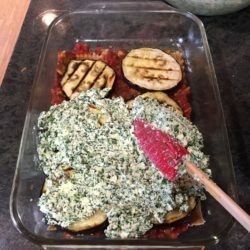 Next add a layer of eggplant, and then 1/2 of the spinach cheese mixture. Repeat. Add a final layer of 3 noodles on top, followed by the remaining sauce. Then sprinkle the remaining cheese on top. 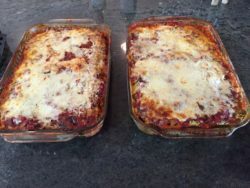 Note that you can prepare the lasagna up to 3 days ahead of time and refrigerate before baking. Preheat oven to 400°F. Cover baking dishes with aluminum foil. 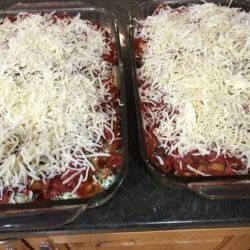 Bake for about 40 minutes. Remove foil and bake for about another 10 minutes to melt cheese. Let sit for 10 minutes to set up. 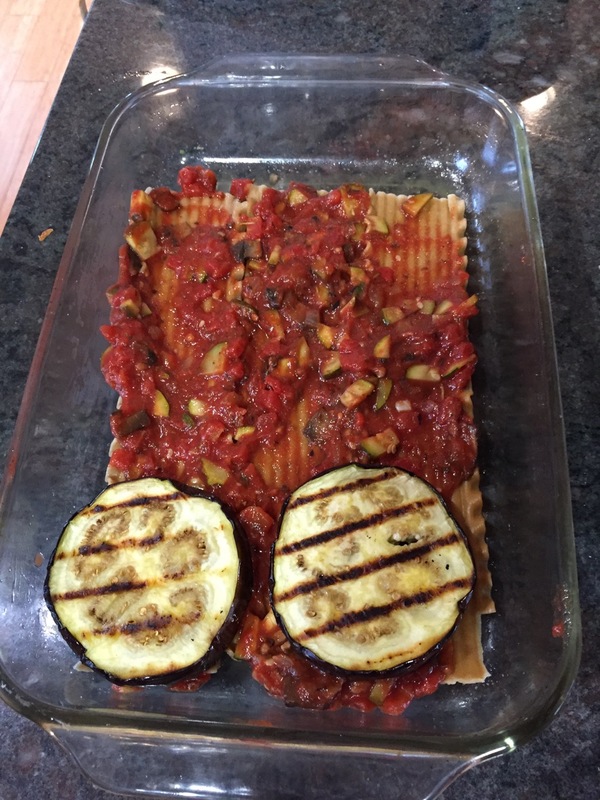 Cut each pan into 12-15 pieces and serve.